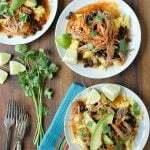 Posole: A Shortcut Slow Cooker Mexican Stew You'll Love! 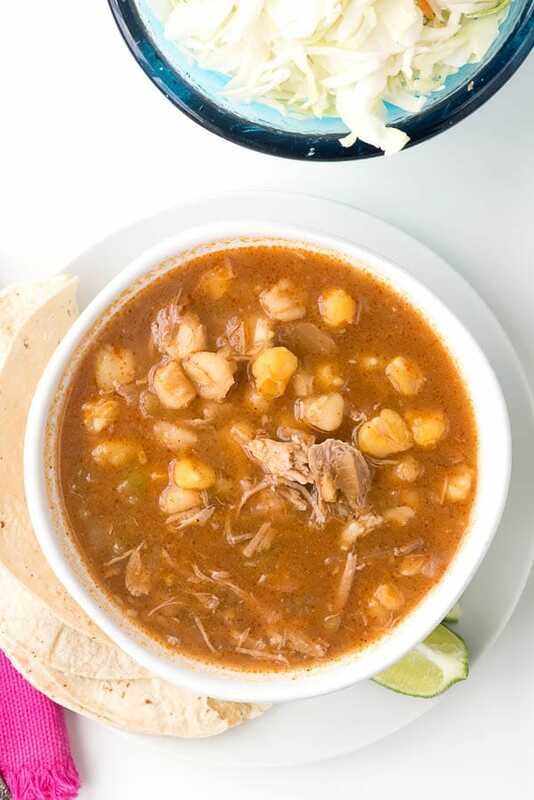 Posole is a soul-warming Mexican stew featuring hominy and pork in a savory broth. This shortcut slow cooker version will keep you warm all winter! I love picking up recipes in my travels. A cold weather favorite is Posole, that I was inspired to make at home after being caught in a Santa Fe, New Mexico snow storm! 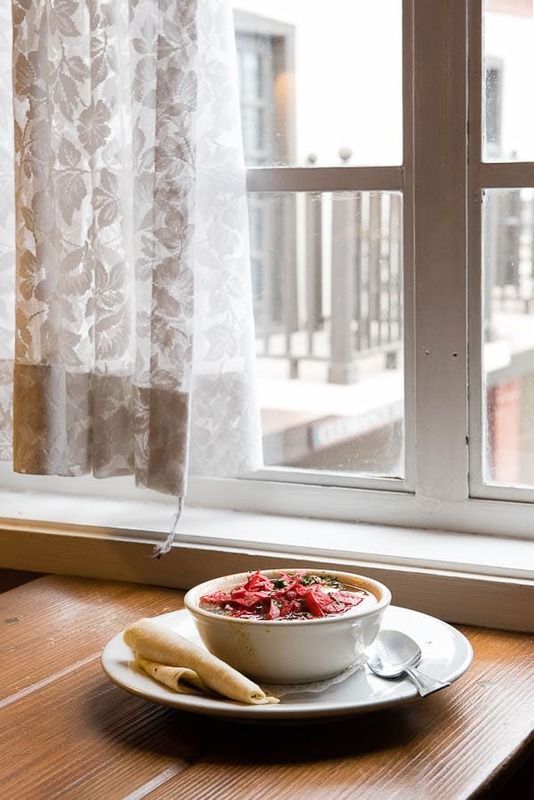 After being stuck in our hotel (the Inn of the Governors) unable to drive back to Colorado, our day was made soul-warming with a bowl of Posole from their Del Charro restaurant. Sipped in the coziness of our room by a roaring pinon wood fire, being snowed in didn’t seem so bad! Immediately following the trip, I created a slow cooker shortcut recipe that remains a favorite recipe to take the chill out of a winter’s day. Red Posole Soup at the Inn of the Governors, Santa Fe, New Mexico. Posole (also spelled Pozole) is an authentic Mexican soup or stew recipe made from hominy (dried corn soaked in a mineral lime bath). 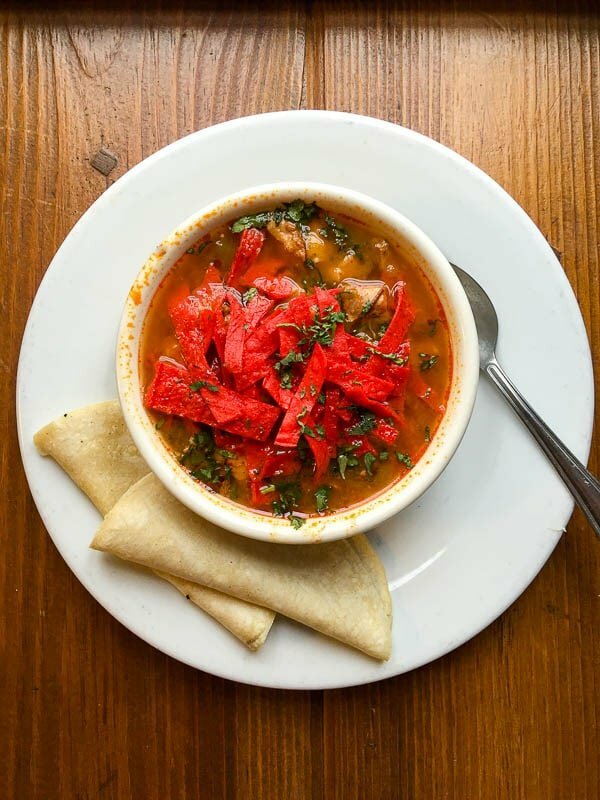 The word ‘posole’ actually translates to mean hominy. Typically it is made with pork however some recipes call for chicken or both meats. Like any recipe with historic roots, there are many versions and many ideas of what defines an authentic Mexican posole recipe. Posole is usually served topped with multiple garnishes. Sliced radishes, avocado, shredded cabbage, onion, garlic and lime wedges to squeeze into the tasty soup are all common. You’ll love this easy way to seed jalapeno peppers! I recently discovered frozen cubed avocado! It is harvested when ripe, peeled and cubed when frozen in a resealable bag. Remove the amount desired, allow it to thaw at room temperature and you are done! Perfect to use as a topping. Family lineages have made posole their way for generations, cementing it as a cornerstone in their culinary traditions. In New Mexico, posole is a New Year tradition, treated very much like eating Hoppin’ John is in the south. Red posole soup (the type I’m sharing today) is made using multiple chilies giving it an earthy red color and spicy flavor. 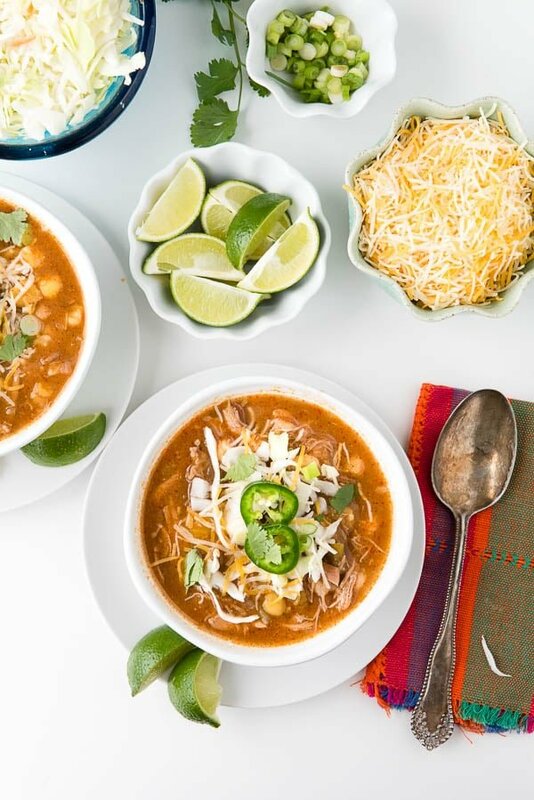 Green posole uses green ingredients such as tomatillos, jalapenos or cilantro to still create a spicy broth however with a green color to the soup. White posole doesn’t include any green or red sauce. I always tread lightly when creating a recipe for something so coveted and traditional as posole. This recipe is made easier while retaining the classic flavors by adding a shortcut step! Instead of preparing the dried peppers and making a paste (similar to making Mole), red enchilada sauce is used. I find it has the same deep-rooted flavors of serious chilies that I loved in the posole that I had in Santa Fe. It can be difficult to find time to make everything from scratch, or to find specific chilies in some areas. This swap yields a delicious satisfying soup one won’t soon forget. Though this posole version uses mild enchilada sauce it is still spicy. 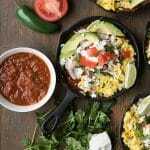 I suggest adding hot sauce when serving if more heat is desired versus using hot enchilada sauce which risks it becoming too spicy for some diners. We love this slow cooker version in my household. It’s easy and the long simmering of the ingredients creates an irresistible Mexican stew! Sprinkle the onions in the bottom of a large 6-7 quart slow cooker. Place the pork shoulder on top of the onions. Cook on HIGH for 7 hours or until the meat is fully cooked. Remove the pork onto a plate or cutting board. Using two forks, shred the meat, discarding any pieces of fat, and return the pork to the slow cooker. Can Posole be Made Ahead of Time? Yes it can be made ahead of time! 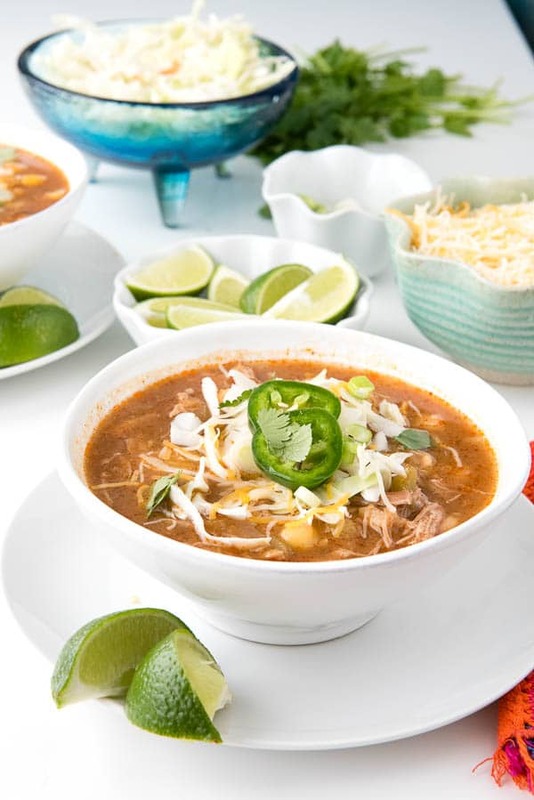 The posole may be removed from the slow cooker, placed into a sealed container (allow to cool first) and refrigerated to allow flavors to deepen further before serving. Simply reheat on the stovetop or microwave before serving. 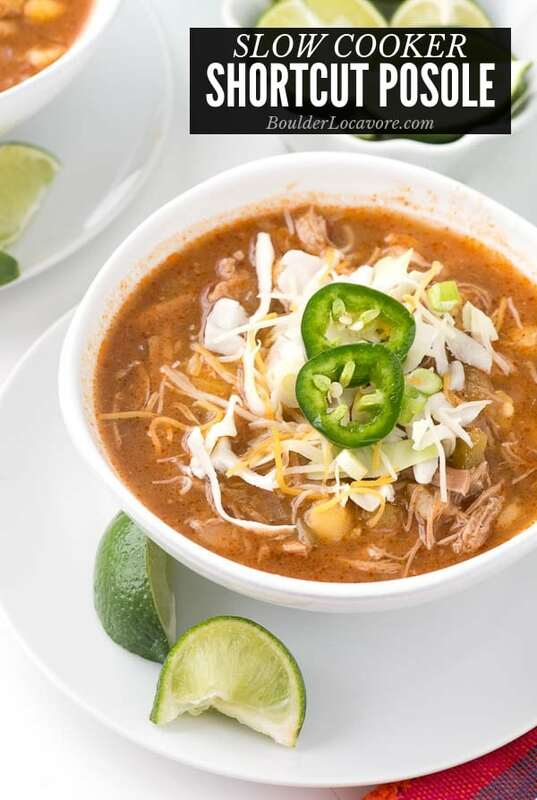 If you’ve tried this Posole recipe please RATE THE RECIPE below! 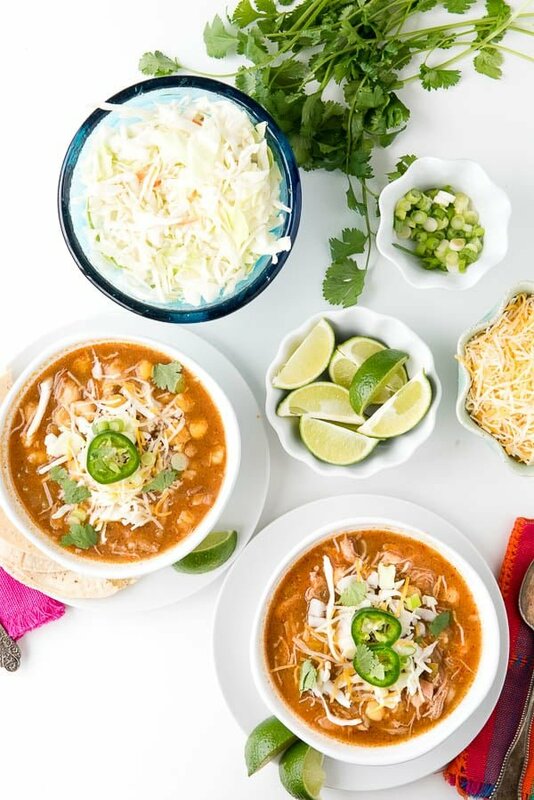 Spicy posole soup has never been easier than making it in the slow cooker! The flavors simmer together over time for a delicious soup. In a large 6-7 quart slow cooker sprinkle the onions on the bottom and place the pork shoulder on top of them. Then layer the ingredients as noted in the ingredient list: garlic, green chilies, white and yellow hominy, cumin, jalapeno slices, enchilada sauce and chicken broth. Cook on HIGH for 7 hours or until the meat is fully cooked. Serve with garnishes. 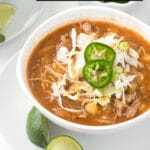 Note: the posole may be removed from the slow cooker, placed into a sealed container (allow to cool first) and refrigerated to allow flavors to deepen further before serving. Though this version uses mild enchilada sauce it is still spicy. I suggest adding hot sauce when serving if more heat is desired versus using hot enchilada sauce which risks it becoming too spicy for some diners. I cant tell you how much we loved this recipe! It was super easy to do in the crock pot and when we walked into the house after a long day of work it smelled so good! Im glad I had the forethought to make a double batch ! I’ll be enjoying it again for lunch again today! Thanks again! Hominy is one of our favorite ingredients. This hit the spot! Posole is always a hit at my house. There’s a lot of information here! I love it – it will come in handy when I make posole again! And I’ve never heard of frozen avocado chunks!! I need to find them!! Where do you get them? They were available through my local Kroger store. A signature brand in the frozen section! It was an exciting find. A fantastic meal! Love this soup. I am new to Mexican stews/soups like this but I have to say this was amazing. So delicious, for sure. YUM!! I love delicious warm soups for winter – this looks like the perfect soup for when the kids come in from sledding! This is one of our favorite soups ever. So good! Can’t get enough. 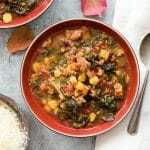 This soup is packed full of delicious flavors! Tastes incredible!